At the ROTC ceremony, from left to right: U.S. Air Force second lieutenants Roberto A. Guerra and Michael J. Arth, U.S. Navy ensign John D. Reed, President Faust, and U.S. Army second lieutenants Jason M. Scherer and J. Danielle Williams. America is fighting two wars. Related issues arose twice during the formal Commencement-week activities. 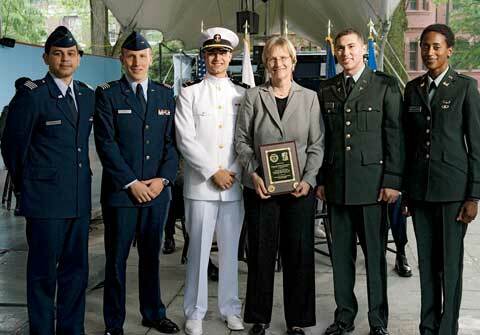 President Drew Faust, addressing her first Reserve Officers’ Training Corps commissioning ceremony on June 4, delivered a nuanced, historical analysis of the values guiding the University and the military—and the remaining division between them: the “don’t ask, don’t tell” policy that prohibits service by acknowledged homosexuals. 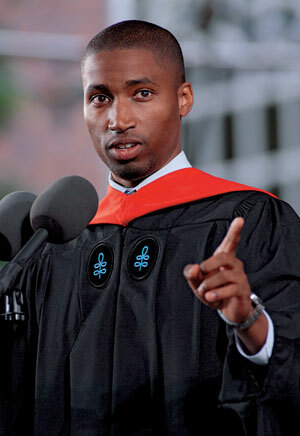 In his graduate English address during the morning exercises the next day, Anthony C. Woods explained the effects of his personal journey from Iraq to the Harvard Kennedy School, from which he subsequently received his M.P.P. degree. Excerpts follow; complete texts and audio recordings appear at www.harvardmag.com/commencement. You have our respect for your choices, our admiration for your commitment, and our deep gratitude for your willingness to confront dangers on the nation’s behalf in the months and years to come. I celebrate you on this important day, as you join these traditions and vow to support and defend the United States Constitution. The freedoms we enjoy depend vitally on the service you and your forebears have undertaken in our behalf. Indeed, I wish that there were more of you. I believe that every Harvard student should have the opportunity to serve in the military, as you do, and as those honored in the past have done. Universities like Harvard are special places, places not just where minds can flourish but where hearts are nourished as well—by commitment to the pursuit of truth, to the availability of opportunity based on merit, to the full inclusion of all in our hopes and possibilities. The United States has long turned to education to nurture the equality fundamental to our national purposes. In 1779, for example, Thomas Jefferson called for a national aristocracy of talent chosen, as he put it, “without regard to wealth, birth or other accidental condition or circumstance,” and “rendered by liberal education…able to guard the sacred deposit of rights and liberties of their fellow citizens.” Education has enlisted the talented—“without regard... to condition or circumstance”—in the service of broader purposes of nation and community. As women claimed the full rights and obligations of citizenship in the course of the twentieth century—the right to vote, the right to serve on juries—so too they sought full inclusion in the military. That there is a woman here about to be commissioned as an officer today [Second Lieutenant J. Danielle Williams, U.S. Army]—that I am here as president to address you—is because of the inexorable logic of those principles of inclusion operating “without regard to…accidental condition or circumstance.” These are the principles that have made Harvard what it is, that have made the American military what it is; these are the principles that have made our nation what it is. These are principles we must continue to honor and strive to extend. We all traveled different paths to Harvard. My journey began in the desert heat of Iraq. Months after graduating as a lieutenant from West Point, I took charge of 17 soldiers and led them to that war-torn country. It didn’t take long for me to confirm that my three hours of Arabic language training weren’t going to get me very far. Like many of you, I had very serious questions about the legitimacy of this war. These questions grew louder on days when tedium and toil turned into chaos and tragedy. On the 11th of October 2005, my men and I responded to the scene of a suicide bomber who violently ended his life and the lives of 40 others at a local market. I wondered if the media would portray the victims as individuals with families like Sergeant Talbert, or would their fate be presented as a cold statistic? Harvard is a very long way from Iraq. The army sent me to the Kennedy School in the summer of 2006, and I welcomed the break from the battlefields of the Middle East. At Harvard I found myself engaged in a battlefield of ideas. Questions shifted from my personal experiences to the universal. Will we reverse the tide of global climate change? Why do we turn a blind eye to genocide and human suffering? Why don’t we commit more resources to scientific research? Why are corporate boardrooms so prone to corruption? Why do we send so many of our children to crumbling schools? I’m not afraid to admit that I felt helpless in the face of these questions.…But something inspiring happened for me at Harvard. As the list of questions grew, I met more and more talented individuals from all across this University—from all around the world—who were also asking difficult questions. I soon realized that Harvard chose us because we know these questions don’t have easy answers. Many who came before us…looked upon the world and could have found reason to despair. But, instead of losing hope, they chose to act. Let us remember the abolitionists. Their legacy calls on us to end slavery and human trafficking in our own time. Let us remember the scientists. Their eradication of polio and smallpox inspires our effort to cure cancer and HIV/AIDS. Let us remember those who ended apartheid in South Africa. Their struggle shows us how to stand up for human rights for the citizens of Tibet. And let us also remember the students who came before us. They fought to end the war in Vietnam and hoped the United States would never again wage a war of choice. What made all of these generations special was their ability to redefine “Q & A.” Instead of responding to questions with answers, they responded with actions. They left a legacy that calls on us to do the same—we have no choice but to follow their example. And so…fellow students of the class of 2008, I ask one final question: will you take action to respond to the challenges of our day?